My name is Evelyn and I work for Spotlight. A few weeks ago I found out that my Sunday penalty rates were going to be cut. I just couldn’t believe it. I only earn $600 a week and I need this money to pay my rent, food, gas and internet. Now I’m going to lose $80 a month because of this cut and I just don’t know how I’m going to be able to survive. I’m not the going to be the only one. There are 700,000 people like me, who work in retail, fast food, hospitality and pharmacies are also having their pay cut. I can’t work out why they are singling us out. Do they think we no longer deserve a weekend or public holiday like everyone else? If we want to do something about this, it’s up to us. That’s why I stood up and told my story on the news, in the hope that we can convince Scott Morrison and his Government that these cuts just aren’t on. I’m asking you to join me in standing up to tell your story. – How will it affect you and your family? – What are the things you’ll have to go without? – What are you worried about? 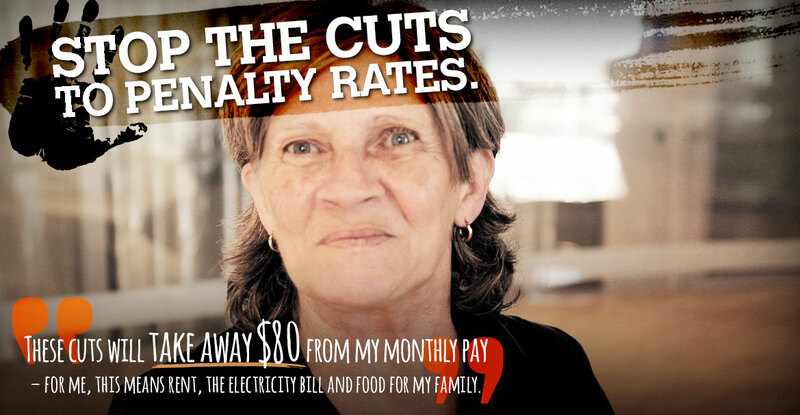 SHARE YOUR STORY: Weekend workers don't deserve a pay cut - protect our penalty rates. Send a message to Prime Minister Turnbull and his Cabinet ministers, tell them why penalty rates matter to you. Are you an SDA member? Please provide your mobile number so we can contact you about membership.